Place of Birth : Patna, Bihar. Naik Ganesh Prasad Yadav was born on Feburary 19, 1971 in Pandeychak village in Patna district, Bihar. He was the son of Ramdeo Prasad. He was belong to 1 Bihar Regiment. On 28 May 1999, During “Operation Vijay”, Naik Ganesh Prasad Yadav belonged to Charlie Company which was assigned the task of capturing point 4268, a well- fortified enemy post at an altitude of 14000 feet in Batalik sub-sector of Kargil. 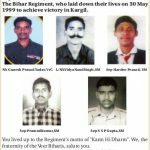 On 29 May 1999, Naik Ganesh Prasad Yadav was at the forefront. Theree was heavy firing of all types. The enemy was in strength. Yet Nk. Yadav, unmindfull of danger to his life and safety, continued his march towards the destination. He killed two mercenaries. He was seriously wounded in the hip. Yet he limped ahead and continued fighting untill he collapsed. Nk. 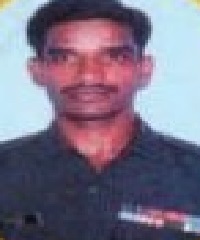 Ganesh Prasad Yadav displayed most consipuous gallantry in the face of enemy and made supreme sacrifice for the nation. Naik Ganesh Prasad Yadav was awarded “Vir Chakra” on 29 May, 1999. Naik Ganesh Prasad Yadav is survived by his father Ramdeo Prasad, and his wife Pushapa Rai, and son Abhishek. After an approach march of four hours at 0400 hours on 29th may 1999 the assault was launched on the enemy. Naik Ganesh Prasad Yadav was in forefront of the assault under heavy volume of enemy artillery and small fire. With his indomitable courage fighting spirit and determination he charged at the enemy sangar with utter disregard to his personal safety and killed two foreign mercenaries. Naik Ganesh Prasad Yadav was seriously wounded in the hip by a volley of bullets. Despite being injured the brave soldier, unmindfully of the danger to his own life continued to fire at the enemy till he succumbed to his injury. Naik Ganesh Prasad Yadav displayed most conspicuous act of gallantry in the face of enemy amd made the supreme sacrifice. 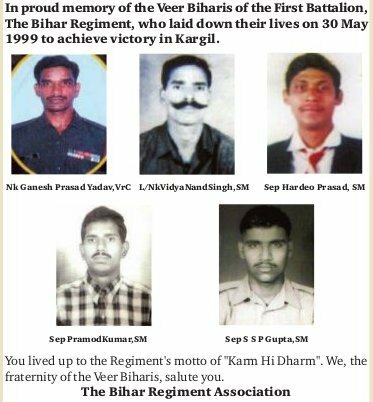 You will always be Saluted for your utmost courage and Supreme Sacrifice to the Nation. You gave your today for our tomorrow, Salute You. Some goals so worthy, It’s glorious even to fail.